North American B-25J-10-NC Mitchell "Jaunty Jo," serial number 43-36192, 498th Bomb Squadron, 348th Bomb Group, 5th Air Force (Far East Air Force) was struck by hidden antiaircraft artillery just after deploying 250-pound (113.4-kilogram) parachute-retarded demolition bombs on the Byoritsu Alcohol Refinery in Formosa. The cockpit has been torn open. Seconds later the plane crashed, killing the entire crew: Second Lieutenant Robert J. Knauf, Second Lieutenant Martin H. Mulner, First Lieutenant Lloyd E. Bodell, Corporal Harold O. Montville, and Gunnery Sergeant Tennyson C. Harrell. The plane was one of 16 B-25s that were attempting to deny the Japanese the ability to process synthetic fuel from sugar cane. 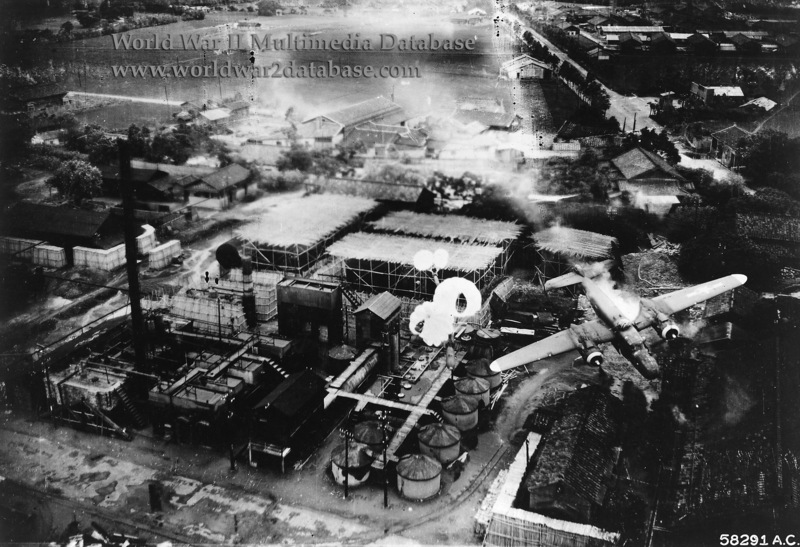 Byoritsu refinery was hit in March, May and July 1945.